A-Coffee is not just a place of work, it is a non-profit center providing care and companionship for autistic youth. A barista makes coffee at A-Coffee. With white mugs neatly laid on the shelves and coffee aroma floating in the air, A-Coffee looks like just another cafe in Shanghai, except for its baristas – eight young people with autism. They make and serve coffee here every weekday, taking turns as baristas and waiters, and their customers are well-trained volunteers instructed to talk with them. Set up in April, the cafe went viral on local social media last month as people posted about it online to show their support. Autism spectrum disorder is characterized by difficulties with social interaction and communication, and by restricted and repetitive behavior. There are no cures, but education and training have proved helpful to manage symptoms. Statistics show China has more than 10 million people on the autism spectrum, among which 2 million are children aged under 14. Cao Xiaoxia, 63, founder of A-Coffee, has been working with autistic children for a decade. A well-known musician, Cao set up Angel's Confidant Salon in 2008, a care center that teaches children with autism to play instruments, sing, and dance. The center has developed over the years with more than 1,000 volunteers. However, Cao was concerned about how the children would fit into the society as they grow up. Cao said she has witnessed adults with autism working and living alone, doing monotonous and repetitive jobs that "can barely help with their conditions." "Cafes are a place for chatting, and making coffee is not very complicated," said Cao. "That's why I set up the cafe for these young people." She wants to create a real life experience to help them learn how to communicate with people, as well as raising social awareness of autism. 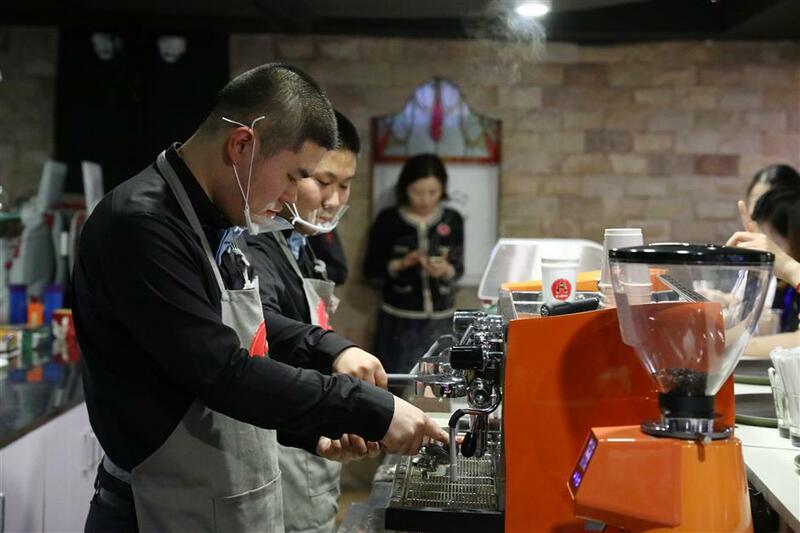 "Clean the filter basket, put it in the coffee machine, fill it with ground coffee, then tamp the coffee," Shen Yanzhen, 15, explained as he showed the process to make a cup of coffee. Shen and the seven other young workers have attended Angel's Confidant Salon and have known Cao for many years. From 11am to 3pm every weekday, three of them work in the cafe, one as a barista, and another two as waiters. Shen has learnt to make many styles of coffee: americano, espresso, latte, and cappuccino, and even has a coffee machine at home to practice. Li Jingwen, who used to be a volunteer at Angel's Confidant Salon, regularly comes to the cafe as a customer to chat with Shen. "We talk about our lives, interests, music, and sometimes we share stories," Li said. A-Coffee is only open to volunteers like Li, who have been trained in communicating with autistic children. They book online in advance to come to the cafe. Li's job is to encourage the youth to talk, and help them with some of the words, phrases, and linguistic contexts they find hard to understand or express. "For example, when you ask for a refill, they might not understand you're referring to more coffee," Li said. "Then we say 'I would like another cup of coffee' and they can understand and learn the context." More than 100 volunteers have set up a WeChat group to discuss their daily exchanges with the teens, their feelings, and reflections. "We chat very actively in the group," said Li. "Everyone wants the best for the children." Since Shen started working in the cafe, he has become more talkative and confident at home, according to his mother. "He also makes me a coffee every day." Shen's mother often accompanies him to the cafe, as do many of the other parents, but Cao said her ultimate goal is to help prepare them for living independently. She is considering plans to offer Chinese, math, and music classes in the cafe, as well as internship programs for her workers, sending those who have done well to other commercial cafes to work one day per month. Cao said there is no complete documentation of an autistic child's development that she can learn from, and she is taking steps she considers best for those under her care. "We watch them growing up like their parents do," Cao said. "We have confidence in how far they can reach."